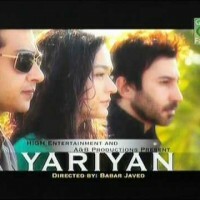 Yariyan is a Pakistani drama serial which is created by A & B Productions and directed by Babar Javed. The serial is running a story of 3 friends Jahan, Rida, and Babar. In the serial Samiya Mumtaz, Faisal Qureshi and Aijaz Aslam are in leading roles. It was aired on GEO TV in 2010. If you are looking for Yariyan drama actors names, timings, on-air days, photos, and OST title song then you can find these here. You can also find the public opinion and reviews about Yariyan drama here.